“Promising tennis players Chad Warren and Megan Williams met on the court when he was 26 and she was 16. Just a few days later, Chad was diagnosed with multiple myeloma, an incurable cancer of the blood. The night before the book club meeting I curled up in bed with the book, and being the procrastinator that I am at times, I began to read it from where I left off…chapter 3. It wasn’t the pressure to finish the book that forced my body to hide in my daughter’s bed for uninterrupted reading time, it was the way the book is written that kept me in deep anticipation the entire way through. The detail, how relatable Megan’s writing voice is, and… the story. The love story of Megan and Chad, kept me awake all night wanting more. I felt like I was watching this love story -that is how descriptive Megan’s words are. In addition, the tenacity, patience, and strength Megan endured during their relationship was incredibly inspiring. I didn’t put the book down until it was over, and I was drowning in tears. I remember flipping the pages with hot tears burning my cheeks and when I finally closed the book, I gave my husband a kiss on the forehead while he lay in bed asleep. I’m pretty sure it was close to 3am, my heart was heavy, and I just wanted to snuggle up to my husband and hold him extra close. In a nutshell, that is how the book made me feel. Megan is such a genuine soul. She’s funny, and one heck of a writer. After meeting at the book club we stayed in touch through social media. We were also both on the speakers panel for SheTalks. I feel so honored to have Megan guest post on Styling the Inside and she’s giving away a copy of her book to one lucky reader! Happy one-year-anniversary of knowing each other! I know it doesn’t have anything to do with my book, Our Interrupted Fairy Tale, but I’d still like to give a copy away to one of your readers to mark our anniversary! I am writing this from my quinoa-crumbed dining room table, having just drank a green juice so I didn’t have to cut up vegetables. My face is sticky-ish with anti-wrinkle moisturizing cream and I’m wearing Superstore pajama shorts that have just shrunk in the dryer.Am I going to Instagram this? Idonthinkso. Why? Because it’s not interesting, it’s not flattering and I don’t look that great. This “style” is one I’m going to keep…inside…my house. But just because I’m not posting this moment online, doesn’t mean I haven’t had other moments throughout my day that are more photo-worthy that I would consider posting. This week, I’ve seen a minimum of five articles that remind us what “real life” looks like compared to what we see online. Each time I skim these pages and read comments I feel the virtual sigh of relief that is released as we’re reassured people’s lives are not as attractive as they appear online. But here’s my question: What if our lives ARE as attractive as they look online? When I look at the images I’ve posted on my social media, I feel they’re a good-looking reflection of what my life is – or at least how my life looked in the moment I took the photo. The key word being – moment. 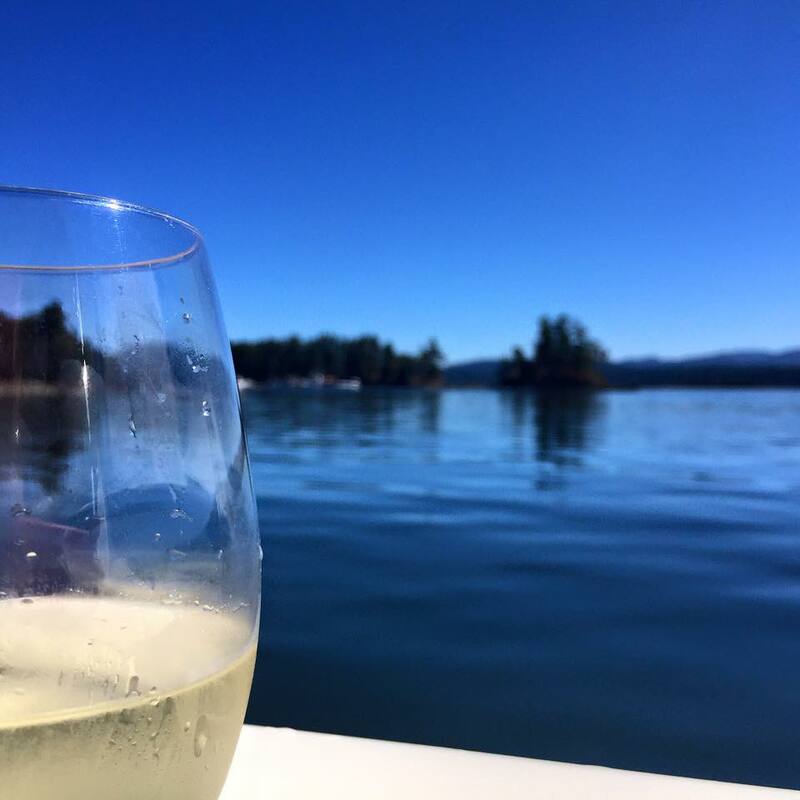 Here’s what I mean – a few weeks ago, I took a photo of my wine-cup on the side of a friend’s boat. The cold drink, the hot ocean air, floating in the water – that moment WAS awesome. I was drinking wine on a boat! It was a great sliver of my day and I took a photo to share it. Five minutes later, after flicking a fly off the brim, my glass was empty and the moment was less picturesque. Does telling you more detail make you feel better that the rest of my day wasn’t as styled as the moment I took the picture? The same goes with the photo of the mom who caught a great moment of lighting at the park with her kids, and captured it – in that moment in her life – she actually looked that good! Shouldn’t we let her have that moment rather than looking for clues that she doesn’t always look that styled and pulled together? I hope we can. Because we’re all playing the same flattering rules – sharing real moments from real days – what you see, in that moment, IS as picture-perfect as it seems. And as long as you’re not captioning “Love my life!” or any other phrases that suggest your life looks like this all the time, we should all be happy for you. So I propose this: As posters, lurkers, followers and friends – let’s stop looking for reassurance that life isn’t always as good as it looks online. Instead, lets appreciate that people ARE having moments in their lives that are beautiful, fun and flattering. And that’s what we’re seeing: moments. Starting tonight, I’m going to change my scrolling habits. I’m going to take every well-styled photo you post at face value. I hope you feel as pretty as you looked, and your day was as fun as you captured it to be…and I look forward to sharing those moments with you. Try it with me – it might feel quite freeing! Megan is absolutely right, people are having moments in their life that are beautiful and there’s no shame in sharing them! Oh yah, I forgot to mention, Megan is currently writing book #2!! I can’t wait to get my hands on it!! !